Some women in the Isle of Man (geographically part of the British Isles but not part of the United Kingdom) gained the right to vote in 1881. Though it did not achieve nationhood until 1907, the colony of New Zealand was the first self-governing country in the world in which all women had the right to vote in, but not to stand for, parliamentary elections in 1893, followed closely by the colony of South Australia in 1894 (which, unlike New Zealand, allowed women to stand for Parliament). In Sweden, conditional women's suffrage was granted during the age of liberty between 1718 and 1772. The Australian Commonwealth Franchise Act of 1902 enabled women to vote at federal elections and also permitted women to stand for election to the Australian Parliament, making the newly-federated country of Australia the first in the modern world to do so. In 1906, the autonomous Grand Duchy of Finland, which became the republic of Finland, was the second country in the world to implement both the right to vote and the right to run for office. Finland was also the first country in Europe to give women the right to vote. The world's first female members of parliament were elected in Finland the following year. In Europe, the last jurisdiction to grant women the right to vote was the Swiss canton of Appenzell Innerrhoden (AI), in 1991; AI is the smallest Swiss canton with c. 14,100 inhabitants in 1990. Women in Switzerland obtained the right to vote at federal level in 1971, and at local cantonal level between 1959 and 1972, except for Appenzell in 1989/1990, see Women's suffrage in Switzerland. In Saudi Arabia women were first allowed to vote in December 2015 in the municipal elections. For other women's rights, see timeline of women's legal rights (other than voting). Friesland: Female landowners are allowed to vote in elections to the States of Friesland in rural districts. Sweden: Female taxpaying property owners of legal majority are allowed to vote in local countryside elections (never rescinded). Velez Province in what was then the New Granada Republic (Colombia) grants universal suffrage to men and women. The Supreme Court annulled the provision for women. South Australia—Australian colony of South Australia: property-owning women were given the vote. Sweden: limited to local elections with votes graded after taxation; universal franchise achieved in 1919, which went into effect at the 1921 elections. The Grand Duchy of Finland ( Russian Empire): limited to taxpaying women in the countryside for municipal elections; and in 1872, extended to the cities. 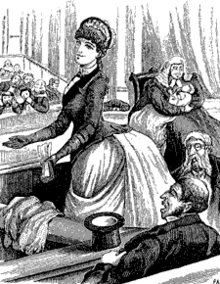 Victoria—Australian colony of Victoria: women were unintentionally enfranchised by the Electoral Act (1863), and proceeded to vote in the following year's elections. The Act was amended in 1865 to correct the error. Kingdom of Bohemia - Austrian Empire: limited to taxpaying women and women in "learned professions" who were allowed to vote by proxy and made eligible for election to the legislative body in 1864. United States-incorporated Territory of Wyoming: full suffrage for women. United States-incorporated Utah Territory, which had previously granted women's suffrage: this was repealed as part of the Edmunds-Tucker Act in 1887. May 10, 1872, New York City: Equal Rights Party nominates Victoria C. Woodhull as their candidate for US President. Isle of Man (self-governing British Crown dependency, with its own parliament and legal system) (limited at first to women "freeholders"and then, a few years later, extended to include women "householders"). Universal suffrage / the franchise for all resident men and women was introduced in 1919. All men and women (with a very few exceptions such as clergy) could also stand for election from 1919. Ontario—Canadian province: limited to widows and spinsters to vote in municipal elections; later extended to other provinces. United States: Proposed Constitutional Amendment to extend suffrage and the right to hold office to women (limited to spinsters and widows who owned property). New Zealand: first self-governing colony in the world in which all women are given the right to vote in parliamentary elections. However, women were barred from standing for election until 1919. Cook Islands (British protectorate) universal suffrage. South Australia: universal suffrage, extending the franchise from property-owning women (granted in 1861) to all women, the first colony in Australia to do so. United Kingdom of Great Britain and Ireland: Local Government Act confirms single women's right to vote in local elections and extends this franchise to some married women. By 1900, over 1 million women were registered for local government elections in England. South Australia: South Australian women became the first in the world to stand for election. This right had been granted the previous year in an act of the South Australian Parliament. Utah (US state): reestablishes women's suffrage upon gaining statehood. Australia: The Commonwealth Franchise Act 1902 gave women the right to vote at federal elections on the same terms as men. Women in South Australia and Western Australia had equal voting rights prior to Federation on 1 January 1901, and were guaranteed the right to vote at the first federal election by section 41 of the Constitution of Australia. 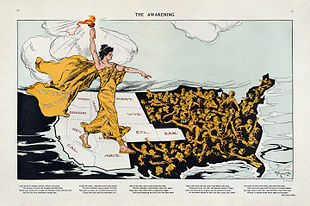 Women in the other four states acquired equal voting rights with the passage of the Commonwealth Franchise Act, which restricted voting based on race but not on gender. The 1903 Australian federal election was the first under the new legislation. Grand Duchy of Finland ( Russian Empire) (first in Europe to give women the right to vote and stand for parliament as the result of 1905 Russian Revolution). 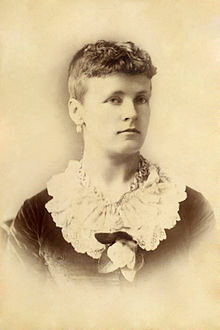 The world's first female members of parliament were elected in Finland the following year. Argentina: Julieta Lanteri, doctor and leading feminist activist, votes in the election for the Buenos Aires City Legislature. She had realized that the government did not make specifications regarding gender, and appealed to justice successfully, becoming the first South American woman to vote. Portugal: Carolina Beatriz Ângelo becomes the first Portuguese woman to vote due to a legal technicality; the law is shortly thereafter altered to specify only literate male citizens over the age of 21 had the right to vote. Isle of Man - all adults could vote or be elected - Widows and single women who owned property could vote from 1881. Turkey (limited to municipal elections). First women electors of Brazil. Turkey (parliamentary elections; full voting rights). Note: in some countries both men and women have limited suffrage. For example, in Brunei, which is a sultanate, there are no national elections, and voting exists only on local issues. In the United Arab Emirates the rulers of the seven emirates each select a proportion of voters for the Federal National Council (FNC) that together account for about 12% of Emirati citizens. ^ 'New Zealand women and the vote', URL: http://www.nzhistory.net.nz/politics/womens-suffrage, (Ministry for Culture and Heritage), updated 17 July 2014. ^ "Bilanz der ständigen Wohnbevölkerung nach Kanton, 1991–2016" (XLS) (official site). Neuchâtel, Switzerland: Federal Statistical Office, FSO. 30 August 2017. Retrieved 2018-05-07. ^ "Women dominate new Swiss cabinet". BBC News. ^ * Wierdsma Schik, P. (1857). "Akademisch proefschrift over de staatsregtelijke geschiedenis der Staten van Friesland van 1581 tot 1795". Google Books (in Dutch). W. Eekhoff. p. 18. Retrieved 11 June 2018. ^ Lucien Felli, "La renaissance du Paolisme". M. Bartoli, Pasquale Paoli, père de la patrie corse, Albatros, 1974, p. 29. "Il est un point où le caractère précurseur des institutions paolines est particulièrement accusé, c'est celui du suffrage en ce qu'il était entendu de manière très large. Il prévoyait en effet le vote des femmes qui, à l'époque, ne votaient pas en France." ^ "Women and the vote: Page 5 – World suffrage timeline". Nzhistory.net.nz. New Zealand History. Retrieved 12 October 2015. ^ "Women in Parliament – Parliament of Victoria". Parliament.vic.gov.au. Retrieved 2013-05-06. ^ a b Heater, Derek (2006). Citizenship in Britain: A History. Edinburgh University Press. p. 136. ISBN 9780748626724. ^ a b "Which Act Gave Women the Right to Vote in Britain?". Synonym. Retrieved 11 February 2015. ^ Rea, Tom. "Right Choice, Wrong Reasons: Wyoming women win the right to vote". wyohistory.org. Retrieved 26 August 2015. ^ Myers, Rebecca (28 May 2013). "General History of Women's Suffrage in Britain". The Independent. Retrieved 26 August 2015. ^ "Canada-WomensVote-WomenSuffrage". Faculty.marianopolis.edu. 1916-01-27. Retrieved 2013-05-06. ^ United States House of Representatives (1888-04-30). "House Joint Resolution (H.J. Res.) 159, Proposing an Amendment to the Constitution to Extend the Right to Vote to Widows and Spinsters who are Property Holders". National Archives Catalog. National Archives and Records Administration. Retrieved 29 July 2016. ^ Chapin, Laura (21 August 2010). "Colorado Led the Way on Women's Suffrage". usnews.com. Retrieved 26 August 2015. ^ a b Alan Fenna; Jane Robbins; John Summers (5 September 2013). Government Politics in Australia. Pearson Higher Education AU. pp. 312–. ISBN 978-1-4860-0138-5. ^ a b August Bebel (12 November 2014). Woman and Socialism (English Edition). Socialist Literature Company. pp. 196–. GGKEY:PAF3FSJXP21. ^ a b Frances Maule; Annie Gertrude Webb Porritt (1917). Woman Suffrage: History, Arguments, and Results : a Collection of Six Popular Booklets Covering Practically the Entire Field of Suffrage Claims and Evidence : Designed Especially for the Convenience of Suffrage Speakers and Writers and for the Use of Debaters and Libraries. National Woman Suffrage Publishing Company. ^ "Constitution of the State of Utah (Article IV Section 1)". 1896-01-04. ^ Pipes, Richard (1997). The Formation of the Soviet Union: Communism and Nationalism, 1917–1923. Harvard University Press. p. 81. ISBN 9780674309517. ^ a b Sulkunen, Irma; Nevala-Nurmi, Seija-L eena; Markkola, Pirjo, eds. (2009). Suffrage, Gender and Citizenship: international perspectives on parliamentary reforms. Newcastle upon Tyne, England: Cambridge Scholars. pp. 242–243. ISBN 978-1-4438-0162-1. ^ See article 4 of the 1918 constitution of the R.S.F.S.R..
^ "History this week:Constitutional Developments in British Guiana and Jamaica between 1890 and 1945 (Part 3)". Stabroek News. Georgetown, Guyana. 13 May 2010. Archived from the original on 6 November 2018. Retrieved 16 February 2019. ^ "Continuation of the Session of the Honourable Legislative Council". The Gleaner. Kingston, Jamaica. 17 May 1919. p. 6. Retrieved 16 February 2019 – via Newspaperarchive.com. ^ Lewis, Jone Johnson. "International Woman Suffrage Timeline". About.com. Retrieved 2 November 2013. ^ Popescu, Camelia. "Lupta pentru dreptul de vot feminin în România interbelică". Historia.ro. Adevărul Holding. Retrieved 4 January 2014. ^ "This Day in World History: February 6, 1935 – Turkey Holds First Election That Allows Women to Vote". OUP Blog. ^ Fraser, Hugh (1918). "Franchises (women)". The Representation of the people act, 1918 : with explanatory notes. London: Sweet and Maxwell. pp. 73–76. ^ a b "Summary: Rights to Vote in Romania". Retrieved 6 October 2014. ^ "CONSTITUŢIA: României din 1938". Retrieved 6 October 2014. ^ "The Evolution of Bermuda's Franchise". Parliamentary Registry Bermuda. ^ "El Voto Feminino en Ecuador, published 6 April 1991, accessed 1 November 2010". Hoy.com.ec. 2011-10-14. Retrieved 2013-05-06. ^ Darwish, Adel (October 25, 2002). "Bahrain's women vote for first time". The Daily Telegraph. London. Retrieved May 25, 2010. ^ a b African Women and Children. Apollo Rwormie. 2001. ISBN 9780275962180. ^ a b "Woman Suffrage Timeline International – Winning the Vote Around the World". Womenshistory.about.com. 1908-04-25. Retrieved 2013-05-06. ^ "Kuwait grants women right to vote". CNN. May 16, 2005. Retrieved 13 April 2014. ^ "Full Text of Iraqi Constitution". Washington Post. October 12, 2005. Retrieved 17 November 2016. Google Spreadsheet with map—above timeline data has been tabulated and can be viewed on a world map for any given year.